At the end of May I will set sail from Avignon, France aboard a Viking Cruise river boat and wend my way through Provence towards the culinary city of Lyon. I find myself day dreaming of French cuisine, Burgundian wines, and the sweet smell of Spring as I lounge on the rooftop deck of the boat. I’d love for you to join me on my voyage, so check out the itinerary here! There's still time to get a passport. In anticipation of the trip, I’ll be sharing some amazing French recipes to get us all in the mood for spring, travel, and good eating! This savory twist on the traditional sweet French cookie is a delicious treat that will wow your friends. Its mild outer crust is balanced with the tangy filling of feta cheese, fresh tomato, basil. It’s the perfect Springtime appetizer to serve at an elegant brunch. Preheat oven to 340°F (170°C). Line a baking sheet with parchment paper. Place a damp kitchen towel on kitchen counter. Place almond meal and confectioner’s sugar in medium bowl, stirring to combine. Place 1 egg white in a medium bowl and beat with an electric mixer until firm shiny peaks form. Spoon into almond mixture, folding in carefully to combine. Place remaining egg white in a medium bowl and beat until soft peaks form. Set aside. Place water and granulated sugar in a small saucepan. Place over medium-low heat, stirring frequently until sugar has dissolved. Continue to boil until mixture reaches a temperature of 245°F (120°C) on a candy thermometer. Very gradually pour sugar syrup into egg white, constantly beating with an electric mixer until shiny peaks form. Fold in almond mixture. Spoon mixture into a large pastry bag fitted with a large round tip (or with no tip) and form 24 small macarons about 2 inches across, leaving 1 inch of space in between. Let stand at room temperature for 20 minutes. Place in oven and bake for 12 minutes. Remove from heat and, leaving macarons on parchment paper, move paper to damp kitchen towel. Let cool to room temperature. To make the filling, place feta cheese, cream cheese, lemon juice, basil, salt and pepper in a small bowl, stirring to combine. Stir in tomato. 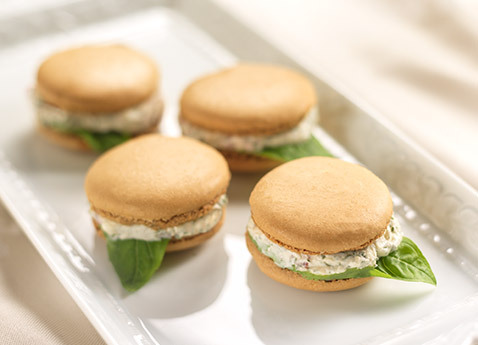 To assemble, sandwich mixture between 2 macarons. Editorial disclosure: Viking Cruises is generously hosting my trip to France.